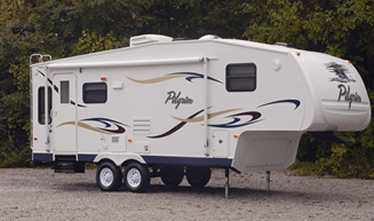 MIDDLEBURY, Ind.--(May 2007)--Pilgrim International announced that May of 2007 marks the company���s fifth year of full production as one of the fastest growing recreational vehicle manufacturers in North America. In May of 2002 the company shipped its first three fifth wheel RVs from its Middlebury, Indiana manufacturing facility. The company has grown from $9 million in sales in its first year to over $135 million annually. In May of 2007 Pilgrim International estimates it will surpass 35,000 recreational vehicles produced in just five years. Today Pilgrim International moves towards its current projected capacity of $250 million for 2008/2009. During this time the company has grown from one to three manufacturing facilities in Middlebury, Indiana. It has up-fitted and equipped its facilities with the latest in vacuum-bonded lamination processes to bring the highest quality products to market. Pilgrim also continues to lead the RV industry in innovations such as its TuffGloss technology--a high-performance, gel-coat composite lamination technology that replaces Fiberglass Reinforced Plastic (FRP). The entire Pilgrim International team understands innovation is the key to future success. ���We���re headed in the direction to utilize composite materials. We���re not going to be the only ones out there, but today, fortunately, we have a scientific group that is working with our industry to bring our products to a much higher level of attention by those in the composite industry. We���re always going to strive to be the innovators. Whether we will be the most innovative, I���m not sure, but we���re going out there with the best in the industry,��� Dave Hoefer, Founder and Chairmen of Pilgrim International concluded.